I’m not one for reality TV and talent shows and if I’m honest I can’t abide the programmes that seem to make fun out of people for viewers entertainment, but I suppose as long as there is a demand and viewers are watching the producers will keep on making the said programmes. However, there is one programme that I must confess to watching and rather enjoying. It doesn’t make fun of the contestants and the judges are called coaches. They are encouraging and kind. I find this format so much more refreshing than judges of other programmes that are rude and make fun of contestants. So if I could sing or even hold any form of note and was brave enough I would choose to showcase my talent on the Voice. For my many of my overseas readers, who may not be familiar with this show, the contestants enter into blind auditions to participate in a contest to be held over the coming weeks. They sing to the coaches who are facing in the opposite direction, if the coaches like what they hear they press their buzzer and their chair turns around to face the contestant. If a contestant is lucky enough to be picked by more than one coach they have to make the difficult decision of which coach to pick. So why do I enjoy this programme? The most important thing for me is it isn’t based on appearances and it is solely the contestant’s voice. However, the main reason I choose to watch this programme is even if a contestant isn’t chosen the coaches are never unkind and always offer kind words of encouragement and wisdom. If they do give criticism it is constructive so the singer has some good advice to take away, not to mention they have had the opportunity to perform on national TV. All the coaches are very different but one thing is clear and that is they really want to help the singers that they select for their team. Whilst watching the show this week I realised how it compared to other reality programmes where the format is to belittle performers and to be unkind. It doesn’t cost anyone to be kind to someone and can make a huge difference to people’s confidence when they are offered kind constructive words. It made me reflect on how our words can affect us and our moods and those around us and we should be careful when speaking words to others, whether they are strangers, friends or family. The way we say something can make a big difference to how we can make someone feel. I believe wherever we can, we should be kind and offer words of encouragement, offer compliments whenever possible. It might even make a big difference to someone’s day helping turn a bad day into an okay day. I know from experience if someone gives me a compliment or if someone is kind to me it lifts my spirits no end. 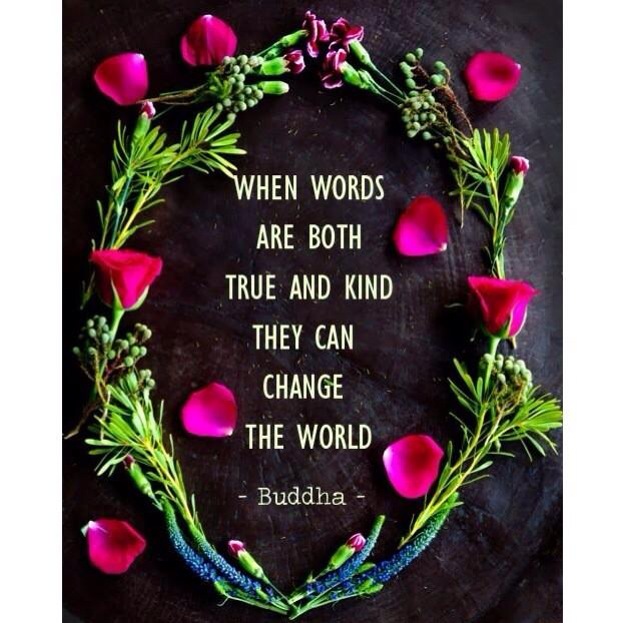 We should also think about how our words will be received by others, for example if we are always complaining or in a bad mood that will no doubt reflect on the other person, especially if they are sensitive. We should also always think before we speak because once our words are spoken they cannot be retracted. Remember the words we speak are a reflection of who we are. I think if we all adopted this attitude to life the world would be a much happier place. Love and our emotions are contagious so I hope we can all collectively spread some love and happiness in the world this week. *photo courtesy of Kind Campaign. Do you communicate with your Guardian Angel? Last weekend I went to visit my amazing 96 year old Grandmother who rather remarkably still lives in her own house and not only does she do her own shopping and cleaning, but she also takes herself off to the hairdressers once a week. She is always happy and never complains. She is my true inspiration. During my visit, she told me that she talks to her Mum every day. I could feel her watching me carefully when she shared this with me, I guess she wanted to see what my reaction might be but I nodded and smiled knowingly. On my drive home, I gave thought to what my Grandmother had said. I too have regular conversations with my parents and other people whom were very close to me that I have lost over the years and I am quite sure there are many other people out there who do the same. I like to believe that my parents are somewhere in the universe looking out for me. It certainly feels that way sometimes. I don’t believe that when someone dies they leave us completely. I know our memories stay with us and we cherish them but I also believe that anyone who played such a big part in our lives remain with us in more ways than just in our memories. 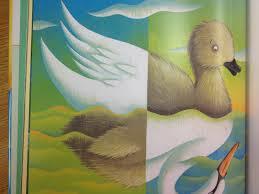 Sometimes, I have a feeling that other beings are also looking out for me and guiding me. By beings, I mean my grandfathers, even ancestors that I didn’t know. I feel extremely close to all of them. I can’t really explain it but I feel safe and looked after. When walking my wonderful dog in the mornings and the birds are in full song singing happily to greet a new day, most mornings I spot a Robin or a very tame blackbird that doesn’t immediately fly away on my approach. For some unexplained reason, this makes me feel very warm and close to my guardian angels or spirit guides or whatever one wants to call them. 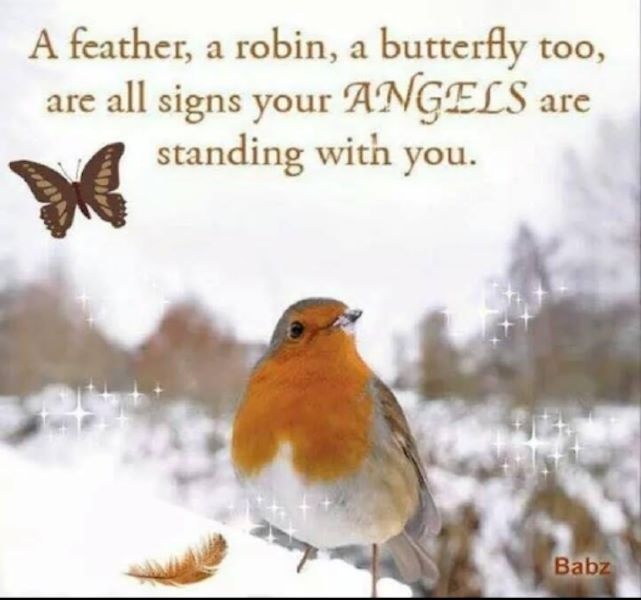 They say that a robin, butterfly or feather are all signs that your Angels are standing with you and I honestly believe this. I always feel surrounded by such love even though I’m out there on my own with just my dog who is usually running ahead of me. If I have a decision to make and I remain open I know I will be helped and guided, I don’t have to worry or stress about anything. I know that life will take care of everything. This may sound strange, weird or whacky to a lot of my readers but I am quite spiritual and also believe we are all connected, past or present. I guess it depends on how tuned in we are and whether we want to be or not. This way of thinking didn’t happen overnight for me but has been a gradual process but I’m so very happy I chose to learn and be open-minded. These feelings and my openness were fuelled even more when I discovered Reiki, The Law of Attraction, visualisation techniques and even quantum physics. The most amazing thing is I believe that I am in tune with my Guardian Angels and they take care of me. I would love to hear from any of my readers who feel the same or experience similar feelings or alternatively if you don’t believe this and believe that when we die that’s it. I find it very interesting how we all choose to see the world and would genuinely be interested to hear your thoughts. Wishing my lovely readers are happy and love filled week. This week as Valentine’s Day approaches I want to write about being single on Valentines Day because for some I know some this can be a big thing and a few of my single friends have been known to become very depressed just before and during Valentine’s Day. Over the years, Valentine’s Day has become so commercialised and people, whether they are in a relationship or not feel pressure to do something and one of my friends pointed out that if you aren’t with someone you feel that it is being rammed down your face and you don’t fit in. I wholeheartedly disagree with this line of thought. Valentine’s Day is just for one day. Admittedly, the shops start displaying red love hearts almost as soon as the New Year is upon us and cards are strategically placed on the most prominent shelves so they are the first thing you see, it’s like they are almost jumping out in front of you, but I ask myself is it really all that bad? I am also currently happily single but I can honestly say that Valentine’s Day does not cause me any concern or discomfort. Equally, I don’t feel that I have to hide away or feel sorry for myself and here’s the reason why. I love romance and the whole idea of falling in love and my regular readers will know that I am a half glass full type of person and I know that anything is possible at any moment in time. I keep an open mind in everything that I do and am excited by the prospect that I could meet someone and fall in love. This could happen on a train, or a random meeting it doesn’t have to be in a conventional way. I also believe in love at first sight and I have in fact fallen in love twice in this way. I also believe there is more chance of meeting someone and falling in love with them when we are not looking for love and are just happy doing the things that we enjoy doing. When we are happy with ourselves we will attract other like-minded people. Like attracts like. The beauty of being single is there is always the possibility that this can happen at any time, so long as we remain open, happy and positive. The world is full of so many opportunities, that is of course if we don’t sit at home embroidering, like the Bennett sisters, waiting for Mr Bingley or Mr Darcy to call. We do of course have to make more of an effort in today’s society especially as we are all so busy. So whilst I might be single this Valentine’s Day there’s hope and there’s always tomorrow, next week or even next year. My point is cupid can aim his arrow at any time and when he does I will be ready and open minded. It’s quite exciting really and in my view no reason to be depressed at all. The key is to be open and to be happy and who knows what might happen. Also on the occasions when I have been in a relationship during Valentine’s Day I would avoid restaurants because they were always so busy and the service was not entirely up to scratch. So I would choose to stay in and have a romantic meal or watch a romantic film but quite frankly I believe every day should be special when you are with the one you love, so why just make an extra special effort on Valentine’s Day? Why not make every day special and show your loved one how much they mean to you. Most importantly, I look on Valentines Day as a reminder of all the love in the world, it is a chance to spread some love and happiness whether we are in a relationship or not. 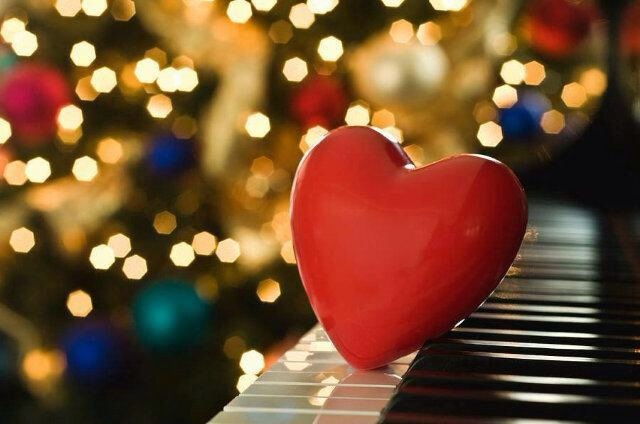 So whether you are single or in the most wonderful relationship in the world, I would love to hear how you plan to spend Valentine’s Day and what it means to you but whatever your status is, remember to spread a little love and happiness. Wishing my lovely readers, whether single, married or in a couple a very Happy Valentine’s Day. I recently had a conversation with an old friend of mine who said as a child she was convinced she was overweight and that feeling has carried on throughout her adult life. I grew up with her and can honestly say she was never overweight and still isn’t. It is only now she realises that she wasn’t. So where did that view of herself stem from? It is amazing how the messages we receive as children by our parents, siblings, teachers and peers can have a huge impact on how we perceive ourselves. If we receive positive messages and encouragement we will believe we can do anything, equally if we receive negative messages to say we aren’t very good at something we will eventually go on to believe this. I recall completing a job application in my best hand writing. My Dad looked at my answers and predicted I wouldn’t get the job. I would like to think he was practising reverse psychology and was not being unkind. My immediate thought was “I will get the job, I’ll show you and prove you wrong”. Whatever his reasons they were not encouraging and just in case you were wondering I did prove him wrong and did in fact secure my dream job. The fact is, if we hear negative messages enough we can go on to believe them and they become part of who we are and how we identify ourselves. Similarly that also works on messages that we communicate to ourselves. If we feel we aren’t good enough, we can’t do something or we aren’t happy with how we look we will eventually come to believe it. So how can we make positive changes to undo some of our beliefs and retrain our thoughts? Again, it goes back to looking in the mirror and loving ourselves or practising and doing the things we believe we can’t do. There is a saying “Fake it until you make it”. This works on many levels, for example if we aren’t feeling great and are a little bit disillusioned with how life is going we can make a decision to be happy, smile a little bit more, even if on the inside we don’t feel like it. The impact of doing this is amazing. The change might not be immediate but it does take place and before we know it we begin to feel happier naturally without faking it. This little trick of faking it until you make it can work on so many levels. Recently I became very scared of riding my new horse. I developed a very strong and unnecessary sense of fear. Horses are very sensitive animals, they pick up on our emotions, he sensed my fear and became fearful because I wasn’t confident. It became a circle of fear, him feeding from my fear and me feeding from his, you can imagine the result – we were both a quivering wreck. Worse still, I immersed myself in books about fear and all the things that can go wrong. I started to believe I was useless even though I have been riding for more years than I care to remember. My fear consumed me. By focussing on the fear and negativity I was creating more negativity. I had to find a way to show him leadership and confidence. So with the help of a friend and my riding instructor and their positive messages I turned the situation around. I started to take small steps, I used visualisation (regular readers will know I am a strong fan of visualisation) and I started to ride in a positive way. I began to trust him and in turn he started to trust me. We began to do things rather than worry about things. Doing is far better and it made a huge difference. Through my visualisation I pictured myself riding him in a positive and confident way, believe me I didn’t feel that confident, but I learnt to breath and not freeze. I faked it and I hope that I am now on the way to making it. If there is anything in your life or a limiting self-belief that is holding you back it’s really worth trying these techniques, tell yourself on a daily basis that you can, visualise yourself doing what you think you can’t. Alternatively if you have issues about how you feel about your appearance or yourself look into the mirror and tell yourself that you are beautiful and really believe it. Remember beauty comes from within. You can be or do anything you want to do, all that is required is sheer determination and positive messaging. I would love to hear from any readers who have turned a situation around or have learnt to undo any negative messages and images they had of themselves. Wishing you all a wonderful love filled happy week.